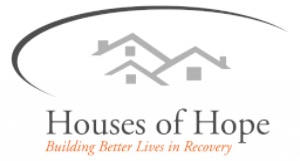 “Building Better Lives in Recovery.” Helping individuals, whose lives have been impacted by substance use and mental health, to integrate back into the community. $8 provides a bus pass for a client without their own transportation. $10.00 provides a haircut for a client. $20 defrays the cost of a medication or doctor visit. $30 provides sheets, blanket, pillow, towels and toiletries for a new client. $50 provides 3 meals per day for a week. $100 will help defray utility costs at a residential facility. $150 covers an apartment deposit for a client transition back to the community. Chad had struggled with serious alcohol and drug use for 28 years and was recently diagnosed with depression. He experienced legal problems, loss of employment, financial struggles and detachment and loss of family. Chad was referred to Houses of Hope to continue treatment for his substance use and mental health - and support as he learned life skills and discipline he would need to successfully transition back to the work force. Chad participated in individual, group and family counseling sessions to improve interactions with others, to learn about his addiction, and to develop healthy ways to maintain his mental and physical health. With that foundation in recovery Chad was able to obtain two part-time jobs. After several months he found a full-time job that offered insurance benefits. In the 11 months he was in treatment Chad remained sober, was able to get caught up on overdue bills, set aside money for a deposit on his own apartment, and for furnishings he needed for that move. Chad was successful in drug court and by the time of his graduation from treatment he had family members that were once again actively involved and supportive of his recovery efforts. As he moved into his own apartment Chad was stable and using a strong sober support group in the community. Chad once again had hope for his future.